So in a sense, Tezuka-san’s persistence gave birth to Raccoon Mario in Mario 3. Yes. But I think in terms of persistence, Miyamoto-san is in an altogether higher league. Miyamoto-san has all kinds of notes and sketches stuck around his desk and from the time we worked on Mario 3, he’d always had this image of Mario riding a dinosaur. Indeed it was Yoshi! (laughs) Well, at that time it was just a picture of Mario riding a dinosaur. Then in Super Mario World 23, you were able to ride a dinosaur for the first time. 23 Super Mario World was the fourth title in the Super Mario series and was released together with the Super Famicom in Japan in November 1990. Miyamoto-san is a huge fan of country and western music and I think things like horse-riding hold a special attraction for him. Yes, that’s right. It’s sadly not there any longer, but there used to be a country and western-themed bar near the office that Miyamoto-san would often take me to. Back at the time of Excitebike, we had people riding motorcycles. Letting Mario ride Yoshi is connected with that. But we couldn’t achieve this on the Famicom. I think Miyamoto-san wanted to have Mario riding a dinosaur even on Mario 3, but due to hardware limitations, we were unable to do it. That's why Tezuka-san came up with Power-Ups where Mario himself would gain the attributes of a raccoon or a frog . No, I’m just giving you a sense of what it was like! But it was pretty much like that, wasn’t it Tezuka-san? (laughs) But I do think that when Miyamoto-san sets his sights on doing something, he will always achieve it in the end. He never gives up… The Mii is actually something that he pursued doggedly for a very long time. The Mii really was a very long time in the works. Speaking of his persistence, the multiplayer mode is another example, having finally been achieved in New Super Mario Bros. Wii. a mini-game where you battle on one screen in the tradition of Mario Bros. This is one of the ideas that he returns to with every Mario game. It’s a fair while ago now, but I once went to see Miyamoto-san to propose an idea for Kirby’s Fun Pak 24. He then set me a task to work on, saying: "We keep trying it every time with Mario but just can't seem to pull it off. Why don't we try having a multiplayer mode in Kirby?" 24 Kirby’s Fun Pak was a game released for the Super Famicom in Japan in March 1996. Two players could team up in the “helper system” which allowed cooperative play for the first time in the series. two-player helper system and including it in the game.Editor’s note: Mr. Sakurai is a former HAL Laboratory employee known as the creator of the Kirby and Smash Bros. games. Recently Nintendo Co., Ltd. and Sora, Inc., where Mr. Sakurai now acts as CEO, have jointly created a new development company, Project Sora Co., Ltd., where Mr. Sakurai will lead development of new software for Nintendo hardware. I see. We gave it a try in Mario 3 but it ended in failure. Then with the Super Famicom, Mode 725 became available. 25 Mode 7 was a mode that allowed graphical effects that included rotating the background and zooming in and out of the screen. This was the function that allowed you to zoom in and out of the screen and rotate it. It enabled you to pull back from the screen, didn’t it? Right. So we thought that even if there were two players we could have the screen zooming out to accommodate them both. While making Super Mario World, we tested all kinds of ways of making the levels multiplayer, but the processing time required meant the system just wasn’t up to it. Then once we’d made it so Mario could ride Yoshi, we gave up on the idea of having a multiplayer mode. Another fifteen years went by and the Nintendo DS came out. So we thought: "This is it!" We now had two screens and we began to do tests in order to create a multiplayer mode which would allow players to appear together on the same level. But you weren’t able to pull it off with New Super Mario Bros. for DS 26, were you? 26 New Super Mario Bros. was released for the Nintendo DS in May 2006 in Japan. Mario versus Luigi . When we tried that, we could see that having a multiplayer mode was indeed a lot of fun. So you went on to finally achieve a four-player multiplayer mode on New Super Mario Bros. Wii. We were able to have the action taking place not on a single screen, but rather with four players together on a scrolling level. So if we count forward from Mario 3, you could say that it’s taken us over two decades to make this a reality. So this is something that you stuck at for a length of time comparable to the time it took the Mii characters to be finally realised. 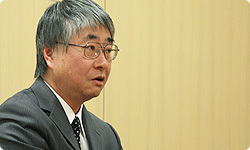 Tezuka-san, did you also have a particular ambition to create a four-player mode in the same way that Miyamoto-san did? Well, I wanted to do it if and when it actually became possible. But because we'd tried and failed so many times in the past, it wasn't as if I was saying: "This time we have to do it!" So you simply had that constant awareness that you had a good idea that you could use if the opportunity presented itself someday. 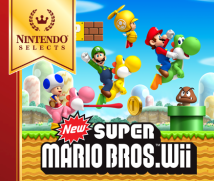 But the tests that we’d done for the DS version proved to be incredibly useful in finally bringing multiplayer Mario to fruition in the new Wii title. So even if it looks like you’re abandoning an idea, another chance to use it will be sure to come round in the end.